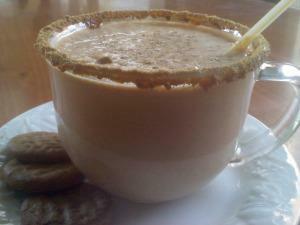 Frozen Pumpkin Spice Latte..rimmed with Molasses and Ginger Snap Crumbs! A frozen summer twist on a classic hot fall drink! ~~In a blender combine 4 Cups Vanilla Ice cream, 1/2 cup canned pumpkin, 1/2 Cup milk, 1/4 teaspoon cinnamon, 1 cup of cooled coffee, and 1 full graham cracker..blend until well combined. BEFORE pouring the goodness into your adorable mugs..rim them with a line of Molasses and then a dip into some crushed up Ginger Snaps…Mmm!! *HINT* Sprinkle some of the Ginger Snap crumbs on the top for extra Ooo’s & Ahh’s! Enjoy! !